Rich Lowry, the editor of National Review, offers his take on President Obama's visit to Cuba in his column in the New York Post. 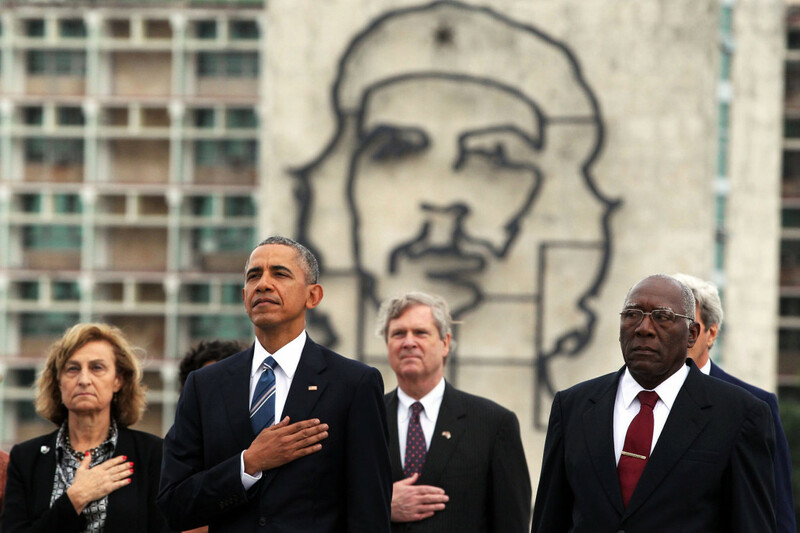 President Obama inadvertently found the perfect photo op for his Cuba visit at a wreath-laying ceremony at the José Marti Memorial in Havana. A news photo at Revolution Square caught Obama standing together with American and Cuban officials with an enormous mural of the iconic revolutionary Che Guevara looming over his shoulder on the adjacent Ministry of the Interior building. Che, of course, is ubiquitous on dorm-room walls and T-shirts in the United States and a hero of the Cuban revolution. He also was a coldblooded killer who set up the Cuban gulag and presided over summary executions of political prisoners. (Trials were, per Che, “an archaic bourgeois detail.”) No doubt, he would have been astonished at the Yanqui president coming to Revolution Square to pay his respects — and exceedingly pleased.